No development is proposed with this request . Note: Three year automatic extension due to offsite improvements plus two year Map Act; One applicant requested extension, effective Sept. 18, 2007; One year state map extension, effective July 15, 2008; One year City map extension, Ordinance 1628, effective April 8, 2009; Two year state map extension, AB 208, effective July 15, 2009; Two year City map extension, Ordinance 1637, effective April 8, 2010; Two year state map extension, AB 116, effective July 11, 2013. Note: One year state map extension, SB 1185, effective July 15, 2008; One year City map extension, Ordinance 1628, effective April 8, 2009; Two year state map extension, AB 333, effective July 15, 2009; Two year City map extension, Ordinance 1637, effective April 8, 2010; Two year state map extension, AB 208, effective July 13, 2011; Two year state map extension, AB 116, effective July 11, 2013. Note: One year state map extension, SB 1185, effective July 15, 2008; One year City map extension, Ordinance 1628, effective April 8, 2009; Two year state map extension, AB 333, effective July 15, 2009; Two year City map extension, Ordinance 1637, effective April 8, 2010; Two year state map extension, SB 208, effective July 13, 2011; Two year state map extension, AB 116, effective July 11, 2013. Note: Two year state map extension, AB 333, effective July 15, 2009; Two year City map extension, Ordinance 1637, effective April 8, 2010; Two year state map extension, AB 208, effective July 13, 2011; Two year state map extension, AB 116, effective July 11, 2013. Note: One year City map extension, Ordinance 1628, effective April 8, 2009; Two year state map extension, AB 333, effective July 15, 2009; Two year City map extension, Ordinance 1637, effective April 8, 2010; Two year state map extension, AB 208, effective July 13, 2011; Two year state map extension, AB 116, effective July 11, 2013. Note: Includes two year state map extension, AB 208, effective July 15, 201; Two year state map extension, AB 116, effective July 11, 2013; City authorized 1 year extension, effective 10-27-16. Note: Includes two year state map extension, AB 208, effective July 15, 2011; Two year state map extension, AB 116, effective July 11, 2013. Site Plan Review request to construct a new 1,920 square feet, two story single-family residence, with 440 square foot garage on a parcel zoned R-3/H (Multi-Family Residential/Historic District). The parcel is located within the Cedar Ravine Road Residential Historic District. Site Plan Review to construct a new 1,856 square feet, two story single-family residence, with 440 square foot garage on a parcel zoned R-3/H (Multi-Family Residential/Historic District). The parcel is located within the Cedar Ravine Road Residential Historic District. Site Plan Review for exterior alterations of an existing home located within the Bedford Avenue – Clay Street Historic Residential District. Alterations involve windows and exterior doors replacement, garage door, deck and stair reestablishment, and stucco and window repair due to water intrusion. Phased Site Plan Review (SPR) involving exterior alterations of two residential structures within the Bedford Street – Clay Street Residential Historic District. Phase 1 - 2922 Bedford Ave residence: replacement of porch decking with redwood decking, porch posts with cedar posts (turned style), front door with fiberglass door with oak texture, gridded slider window along north elevation with single-hung vinyl window in modified opening, and replacement of mismatched siding along all exterior elevations with shiplap hardboard siding; add porch roof gable to front, Bedford Avenue elevation, and add wood shutters to windows. Phase 2 – 2920 Bedford Ave residence/garage: replace mismatched siding along all elevations with shiplap hardboard siding, slider window with single-hung vinyl window in modified opening, and hinged garaged doors with three-panel steel doors; add new single-hung vinyl window in former opening, add new shutters to replaced window, existing double window and proposed window; add pergola over garage door openings, and add a covered entry gable. Site Plan Review (SPR) request to replace nine wood frame single pane windows with dual pane, white vinyl retrofit windows in their existing openings; approval of one white vinyl window installed without permit. Site is within the Coloma Street – Spring Street Residential Historic District. This project has been determined to qualify for a Class 1 Categorically Exemption per Section 15301(e) of the California Environmental Quality Act (CEQA) Guidelines. Site Plan Review (SPR) request requests Site Plan Review (SPR) to replace twelve wood frame single pane, single hung windows with dual pane, white vinyl single hung retrofit windows in their existing openings; and, replace two exterior doors and encasements with pre-hung exterior doors. Site is within the Bedford Street – Clay Street Residential Historic District. This project has been determined to qualify for a Class 1 Categorically Exemption per Section 15301(e) of the California Environmental Quality Act (CEQA) Guidelines. Conditional Use Permit to allow conversion of the existing business professional building located at 3097 Cedar Ravine Road (APN 004-011-221) into a single-family residence; and, to discontinue Site Plan Review (SPR) 91-11 and CUP 91-06, authorized in 1991, that resulted in the conversion of an existing single-family residence to a business professional office building. 4. An Addendum to the Mitigated Negative Declaration for the approved The Ridge at Orchard Hill Planned Development project (Planned Development 03-01). (2) Zone re-classification to Commercial – Housing Opportunity Overlay (C-HO). The HO Overlay zone would provide an option for development on the project site under the provisions of the HO Overlay zone, or the project site could be developed under the provisions and regulations of the underlying (C) Commercial zone but not both. No development plans to construct residential units have been submitted at this time for the Project Site. The City has prepared an Initial Study/Draft Mitigated Negative Declaration that analyzed potential environmental effects of build-out of the Project Location being considered for the land use classification and zone designation amendments at the HO Overlay zone maximum density of 24 dwelling units per acre on the 7.60 acres. Maximum yield would be 182 residential units under the HO Overlay zone provisions. 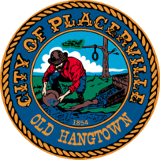 General Plan Land Use Map and Zoning Map Amendments; Amendment to the Official Development Plan for the Placerville Heritage Homes Subdivision Planned Development that would partially implement Program 3. (3) amendment to the Official Development Plan for Placerville Heritage Homes Subdivision Planned Development (PD06-01) project, authorizing the provisions of the Housing Opportunity Zone to A.P.N. 323-400-20.